RapidSpar Data Recovery by Sewelltech - Sewelltech, Inc.
Fortunately, Sewelltech using the RapidSpar (special hardware and software) may be able to help. With RapidSpar we can solve between 80 percent and 90 percent of typical data recovery problems where other systems fail. 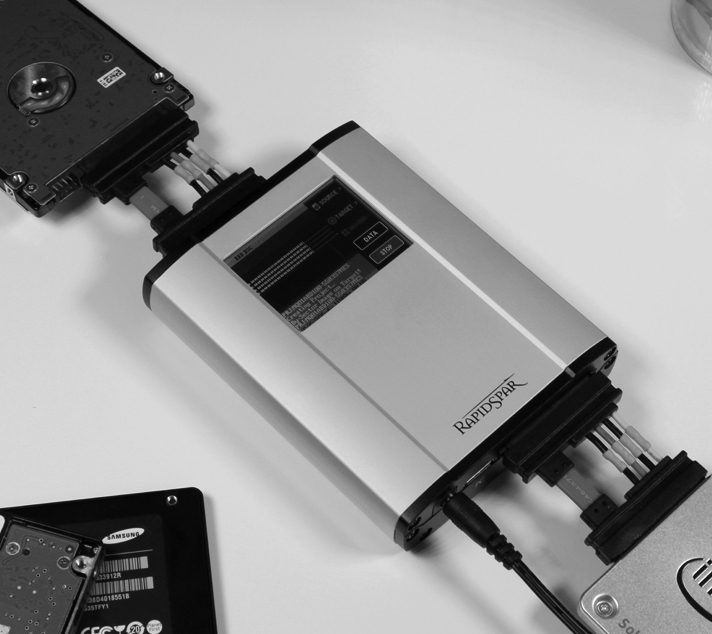 RapidSpar is a new, standalone device that helps our Apple Certified Technicians to retrieve data from malfunctioning hard disks and solid state drives (SSDs). RapidSpar handles the full range of data recovery issues including physical storage degradation, firmware corruption, and logical corruption. RapidSpar’s self-learning, cloud-based engine — RapidNebula — serves as a kind of “virtual data recovery expert,” collecting metrics from affected drives and sending them to the cloud for comparison with cases previously solved by RapidSpar units around the world. The solution uses the patterns or similarities it identifies to diagnose problems and map out a course of corrective action. Its aim is to automatically recover all cases that do not require physical intervention in a class 100 clean air environment. I downloaded this software tool, why can’t I use that instead? Software data recovery tools do not have direct control or exclusive access to the drive like the RapidSpar system does, Software tools can only send read commands to the OS API; with luck, the communication attempt passes through each layer of system software without any issues, and the drive is capable of consistently processing read commands. But if the drive isn’t operating as expected, communication can break down at any point, halting the recovery effort. If the read command falls on a bad sector, for example, software tools do not have any say in how this is handled; that part will be decided by layers of system software that the software tool can’t control. This means every time the read command falls on a bad sector, the drive will spend 3-7 seconds making hundreds of failed read attempts, then conclude the sector is bad, write to its firmware area (located on the platters) to update various logs, and finally respond with an error message, at which point the software data recovery tool can send the next read command. This process wastes time, quickly causes further physical degradation of the drive, and risks firmware corruption. If the drive has an internal exception when processing the bad sector — for example, while updating its firmware logs — it may not respond within a reasonable timeframe, causing the computer to freeze, restart, or drop the connection to the drive. To make matters worse, because the software tool has no direct connection to the drive, it may not be aware when the connection has been dropped. In that case, it will keep trying to recover data, but none of its attempts will actually reach the drive. After 20-30 seconds of idling, modern drives execute self-scans, attempting to seek out and reallocate bad sectors. This state quickly degrades the drive; entering it is one of the worst things that can happen to a degrading drive.